I first heard about this cake on the radio a few years ago in a Dorie Greenspan spot around Thanksgiving. This cake immediately became a holiday staple at my house, and even though I’ve seen this on a dozen other blogs, I’m compelled to share it! It’s sometimes called “All In One Cake”, most likely because it contains many ingredients used in fall/winter holiday cooking. 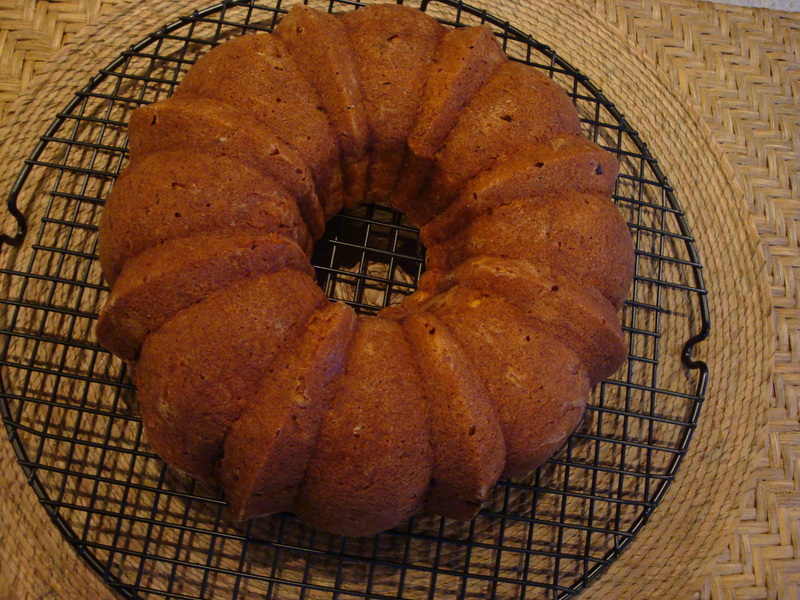 I made this prior to Thanksgiving intending to post it then, but had a cake “fail” – the cake stuck to the bundt pan! So I hotfooted it over to the NordicWare store to get the lowdown on how to make sure this didn’t happen again. Since the founder of NordicWare, David Dahlquist, invented the bundt pan back in the 1950’s, I knew they’d be able to help. 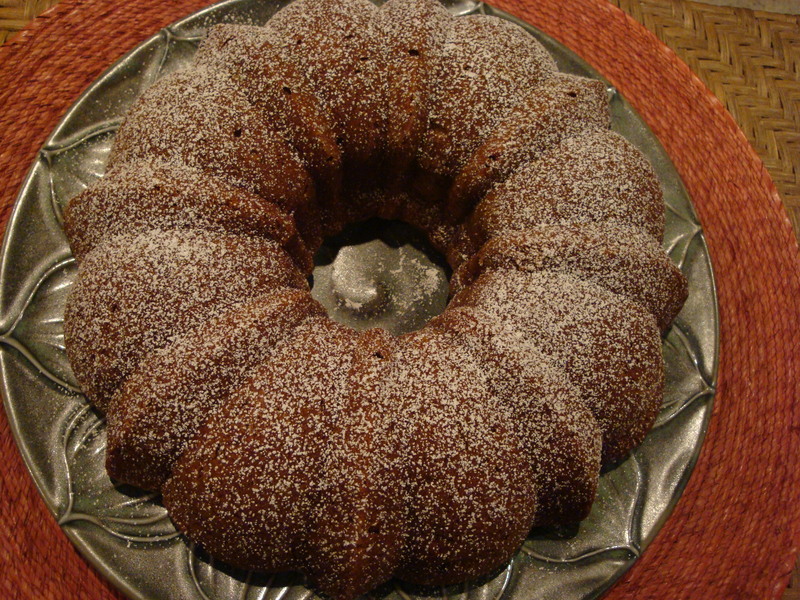 They have compiled these tips on how to make the perfect bundt cake, and I heartily recommend that you check these out. This cake is fantastic! I’ve made it for the past few years at the holidays since Aunt Suzy first shared it with me. As I’ve said before, I’m a lover of all things pumpkin, and this cake has so many other goodies in it, too! I really think it’s a must for Christmas or Thanksgiving…I would even give up pumpkin pie to have it. I am a sucker for cakes, though! 🙂 The last time I made it, I didn’t chop the cranberries, apples and nuts small enough, and it kind of fell apart when we served it. It’s especially important, I think, to make sure the apples are in really small pieces (like 1/4″). I might even use the food processor to chop the apples and cranberries next time I make it (just pulse them a few times). Great point, Margaux, about making sure all the pieces of goodies aren’t too big. Thanks for mentioning this! I, for one, am looking forward to having a piece of this for breakfast with a cup of strong coffee! It occurs to me to also note that this cake is a great dessert when there’s going to be a crowd – it serves many! Preheat oven at 350 degrees. 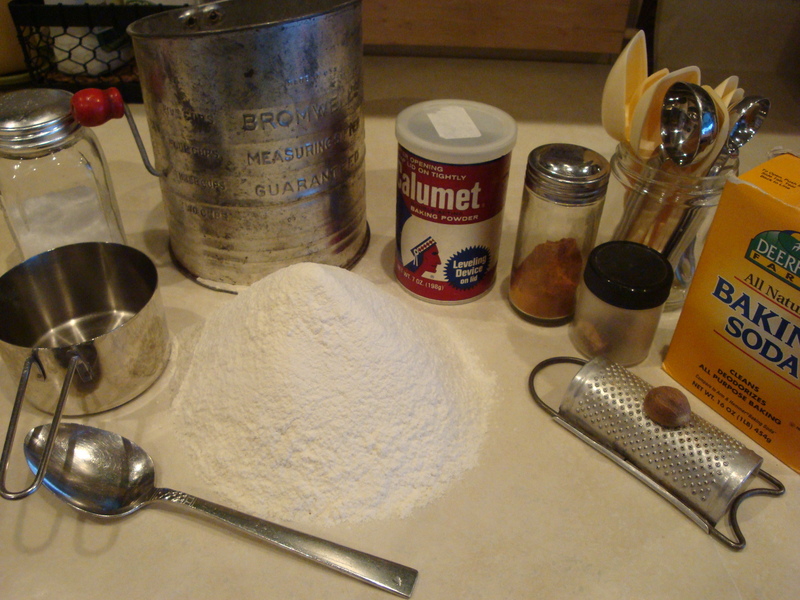 You will need a 9-10 inch greased and floured bundt pan and an electric mixer. Whisk the dry ingredients together in a bowl. 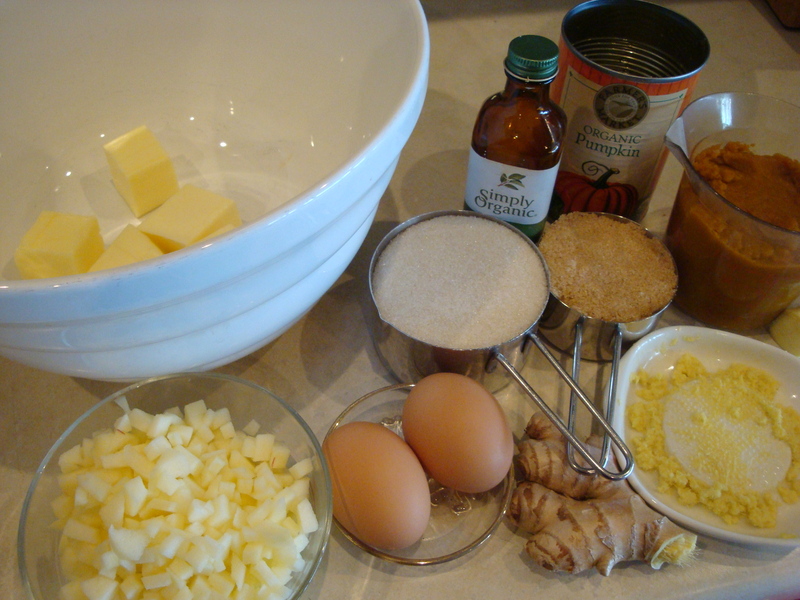 If you do not have fresh ginger, you can substitute 1 teaspoon dried with the dry ingredients. Set aside. In a large mixing bowl, cream the butter with the sugar on high speed until fluffy. Add eggs one at a time and beat on high after each for 1 minute. Add the vanilla and beat a little more. 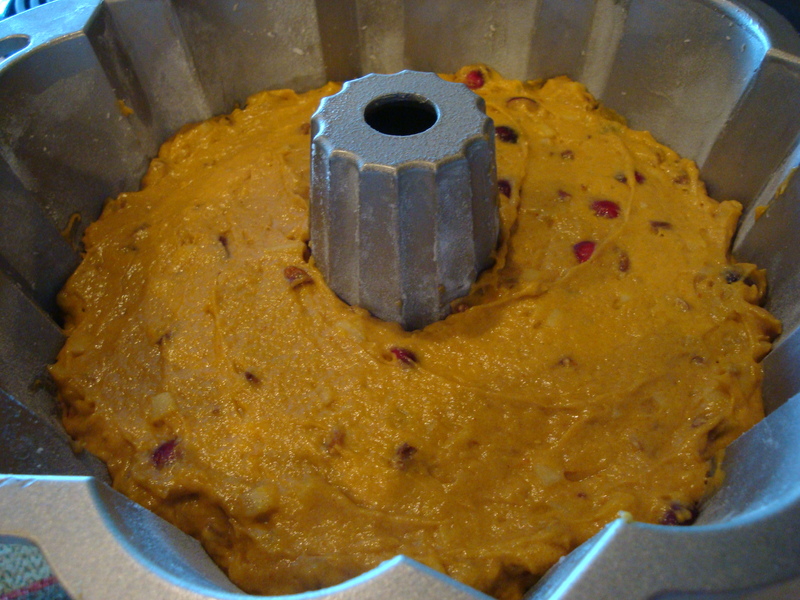 Reduce speed to low and add the pumpkin, chopped apple and grated ginger and beat till mixed. Add the dry ingredients and beat on low until incorporated. 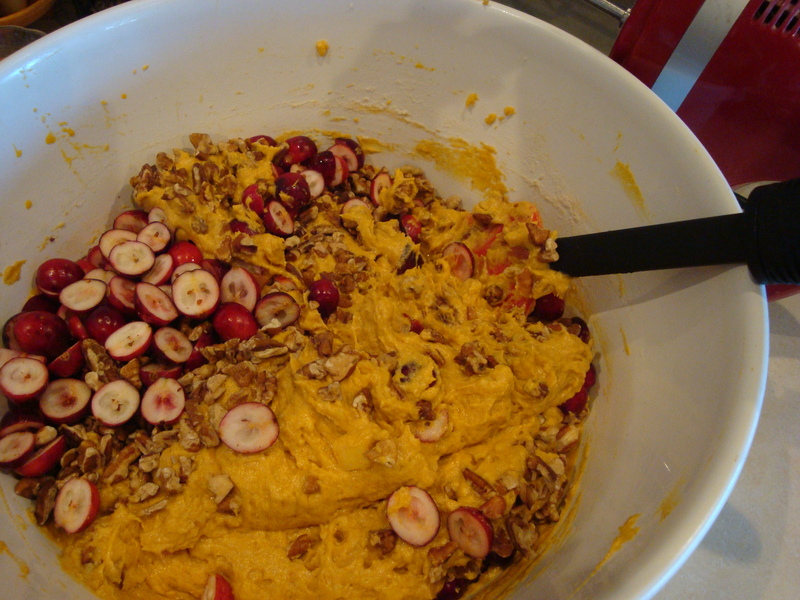 Fold in the cranberries and pecans with a rubber spatula and stir until spread evenly through the batter. Spoon the batter into the bundt pan and then smooth the top with the spatula. Tap the pan on the counter a few times to settle the batter into the pattern in the pan – this is one of the NordicWare tips. Bake for 60-70 minutes until a knife inserted into the center comes out clean. Transfer the pan to a rack and cool for 10 minutes. Unmold onto the rack and cool to room temperature. Just before serving, dust with powdered sugar. COOK’S NOTES: Pay careful attention to quantities in this recipe – there’s a lot going on. For example, this time I used the entire can of pumpkin instead of measuring out the 1 1/4 cups. I ended up with a custard-like cake vs. cake-like cake. One time I put in 2 sticks of butter instead of measuring 10 Tablespoons because I had set both sticks out to soften. This didn’t ruin the cake either, but made it a lot more buttery! Some would say not such a bad thing. On another note, you can store the cake, wrapped, for up to 4 days or wrap in foil and freeze. Unless we are making this for a crowd, half goes in the freezer for later use. You can use the Maple Glaze that follows if you want, although I think this cake is just delicious plain or with powdered sugar. Sift 6 tablespoons powdered sugar into a bowl. Stir in 2 tablespoons maple syrup. Add more syrup a little at a time until the icing runs off the tip of the spoon (maybe ½ tbsp more). Put the cooled cake on a plate and drizzle with the icing. Let it set for a few minutes before serving.